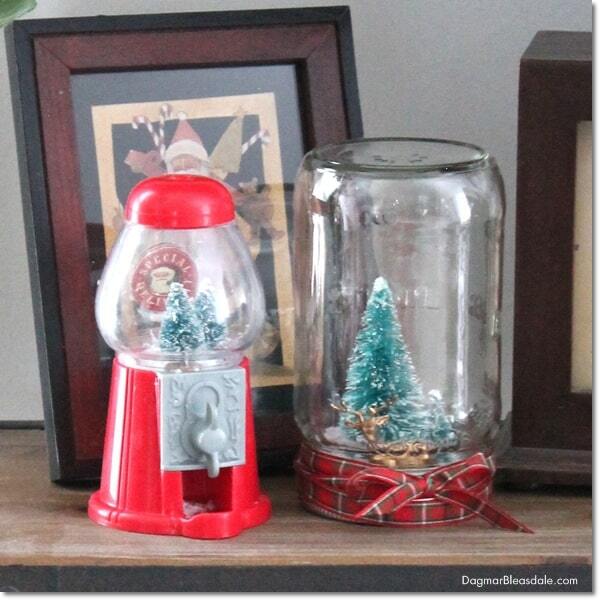 I’m so glad I held on to this little empty toy gumball machine — I turned it into a gumball machine snow globe! It had been sitting in our kitchen cabinet after Landon received it as a birthday party favor a few years ago, and I was tempted to throw it out many times. But I have a hard time throwing out anything I might be able to use or reuse or repurpose at some point. Remember when I used the twist ties from bread bags I had been saving for our container garden fencing? 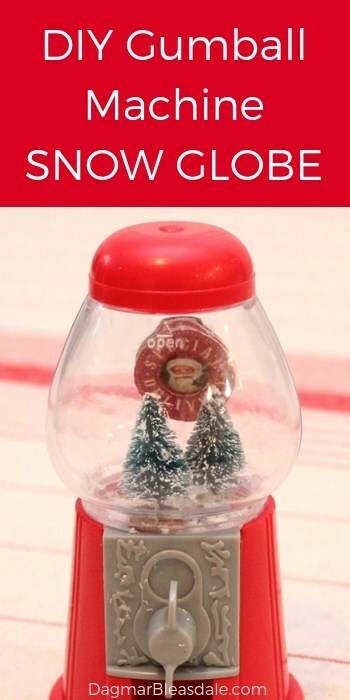 I turned the gumball machine into a snow globe with just a few supplies, and in literally 5 minutes! 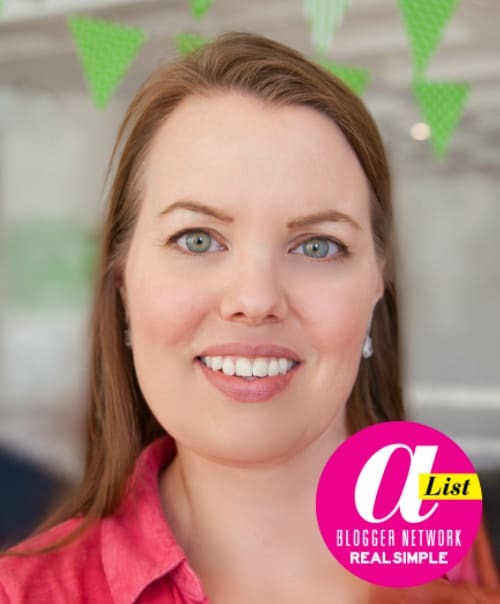 This wasn’t my idea — I saw Kathleen’s post on Charm Bracelet Diva about it, and then she linked it up to my “Thrifty & Vintage Finds” link party. She was inspired by Rebecca’s post on The Crafted Sparrow. Thanks, Kathleen, for sharing this idea! I couldn’t grab my little gumball machine fast enough to make this. I still had all of the supplies sitting around for it after making this pie tin & bottle brush tree centerpiece. Kathleen’s tutorial is longer than mine because her gumball machine was larger, and she had to unscrew the parts. That’s not needed if you have a little plastic gumball machines like mine. 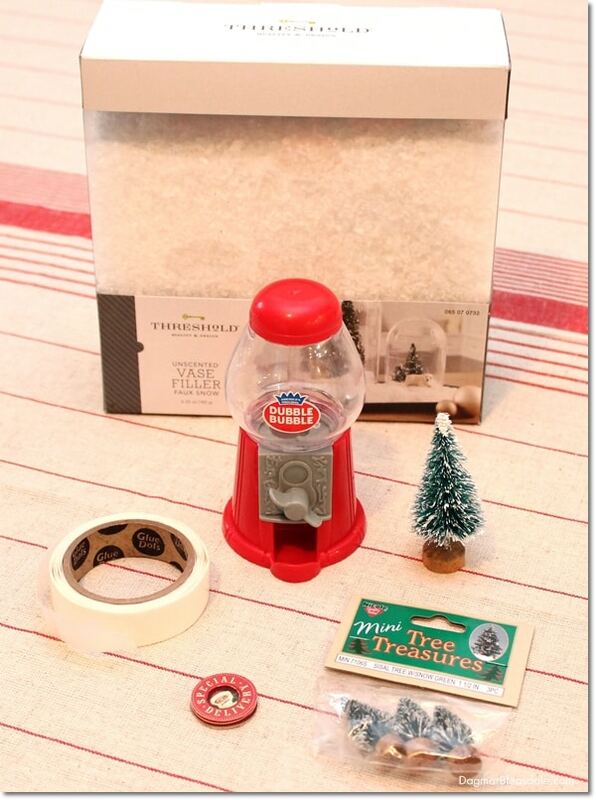 Making the snow globe took just a minute once you have all of the supplies together. I unscrewed the top part of the gumball machine, added a glue dot to the sticker, and stuck it into the inside of the glove to cover the Dubble Bubble logo. Then I added glue dots to the two little bottle brush trees and stuck them to the base of the globe. I had wanted to use one of the smaller trees, but it was too tall and would’ve taken up too much space in the globe. I added just a bit of the fake snow and then screwed the globe back on, but this time so the logo was on the back and the sticker visible from the front. 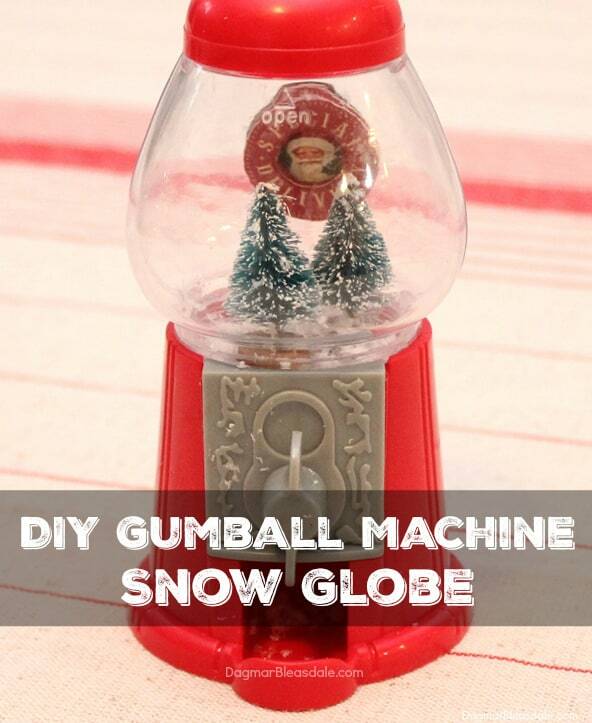 Voilaa — that’s all it took to make this gumball machine snow globe! 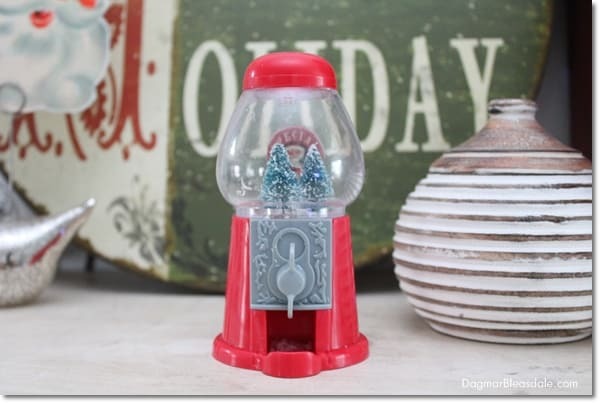 I’m so glad I found a cute way to repurpose this little toy gumball machine! 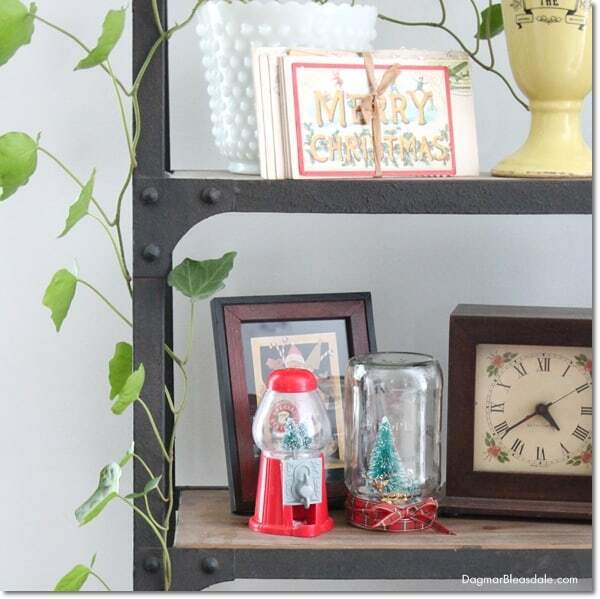 It fits perfectly next to my mason jar snow globe you saw in my Christmas home tour. If you like this DIY project, pin it for later! I do this with a giant gumball machine for the holidays. It’s such a cute look and I’ll have to look for some smaller gumball machines too. Thanks for sharing on Merry Monday! This is really cute! 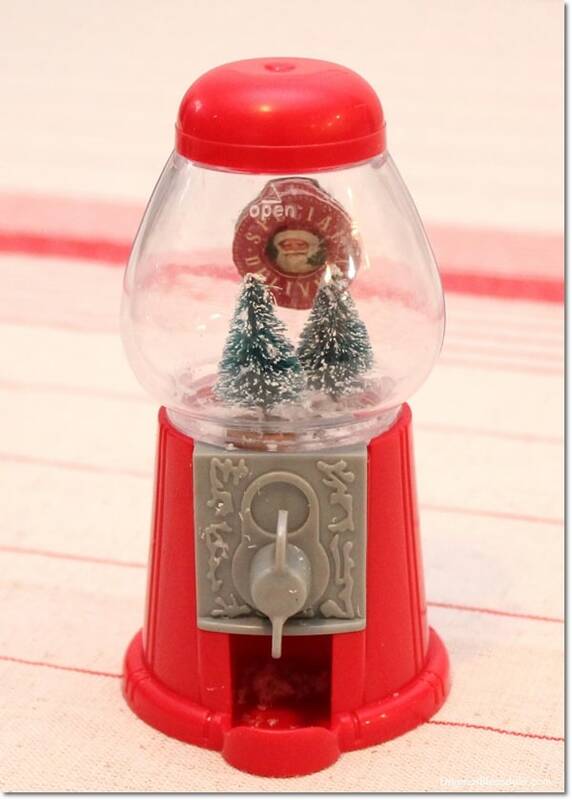 The red of the gumball machine is so perfect for a christmas craft. 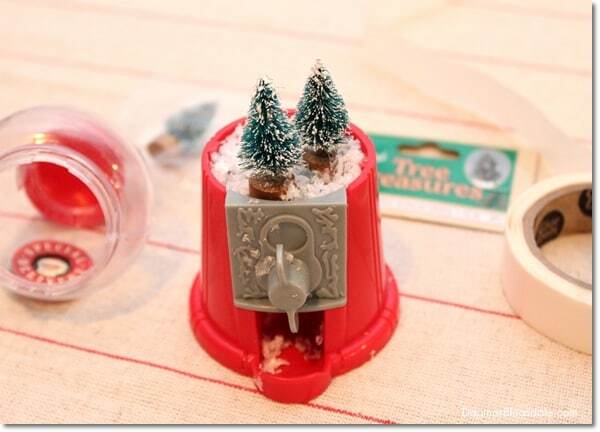 I always love to see what kind of fun scenes people put in their gumball machines! I made some a few years ago but haven’t since and seeing yours makes me wish I would have this year. So cute! I love this idea ! 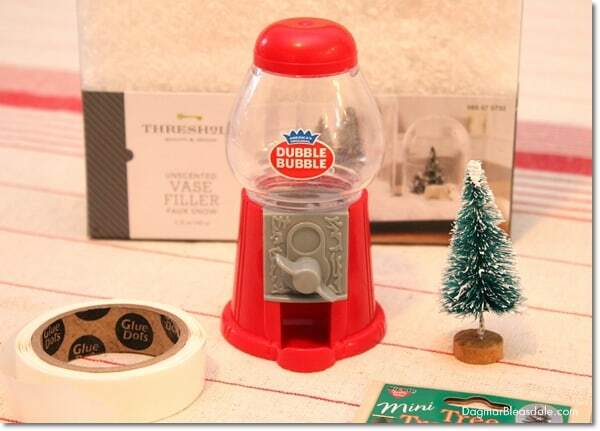 I to have an old gumball machine sitting in the cupboard. 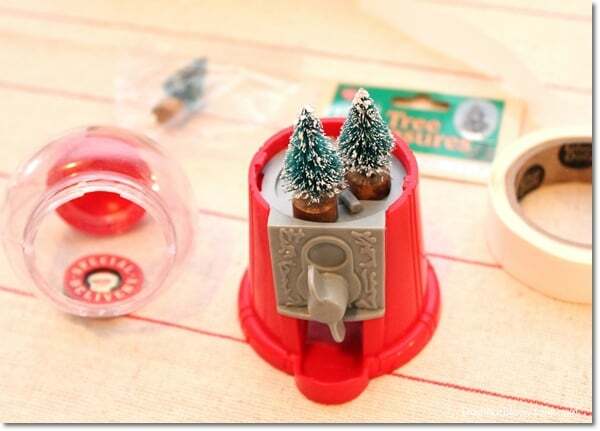 I’m pinning this to make one next Christmas. Thanks for the inspiration. 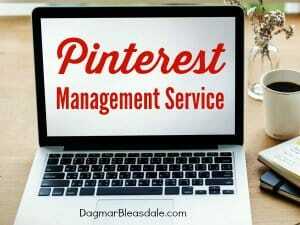 Thank you for pinning, Claire!